The Center for Structural & Functional Neuroscience (CSFN) is excited to announce that it is once again sponsoring a paid summer fellowship program for undergraduate students interested in gaining research experience. Students have the opportunity to spend 10-12 weeks during the summer working in the laboratory group of a UM neuroscientist. In addition to laboratory experience, the program also includes a seminar series, to expand student’s knowledge base in the neurosciences and enhance scientific communication skills. 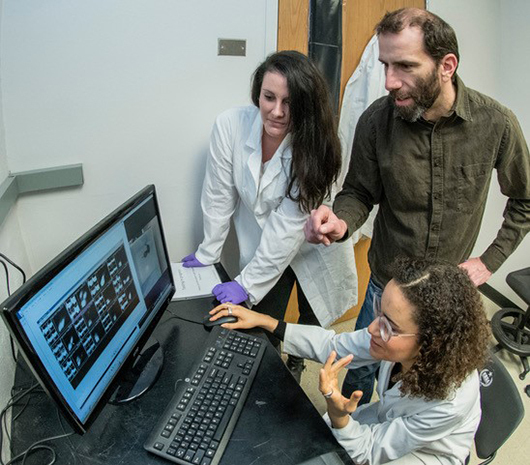 Beyond projects in Cellular & Molecular and Cognitive & Behavioral Neuroscience, the CSFN is also interested in sponsoring student projects that focus on the intersection of neuroscience with the Humanities, Arts & Education fields. These projects may include a non-neuroscience UM faculty mentor and be designed as either an independent or collaborative effort with other CSFN faculty. A number of the summer undergraduate research fellowships will be funded through support generously provided by the W.M. Keck Foundation as part of the UM project: Neuroscience: a novel perspective for the campus-wide integration of STEM, Liberal Arts, and Education curricula. For more information about the summer research program visit the CSFN Sponsored Summer Fellowship web page or contact program director Dr. Jesse Hay.